* I mention that electricity costs are expected to rise by 46% in the next five years, or about four times the rate of inflation. The figure comes from the Ontario government. It was in last fall's Ontario Fall Economic Update, as were lots of other numbers on this subject. The specific page with the figures on electricity is here. Here's a chart of what electricity prices are going to do over the next few years, from the 2010 Fall Economic Update. Over the next five years, however, residential electricity prices are expected to rise by 46 per cent, which is an average annual rate of about 7.9 per cent. This increase will be due to two factors: upgrading and modernizing Ontario’s existing capacity in nuclear and natural gas generation, transmission and distribution (44 per cent); and the investment in new clean, renewable energy generation (56 per cent). So even under the government's own trust-us-we-know-what-we're-doing accounting, more than half of the escalation in Ontario energy prices is caused by the high cost of wind and solar. That's due to the fact that wind and solar producers are being paid rates that are run from double to umpteen times the rates paid electricity produced by coal, gas, hydro and nuclear energy. And of the remaining 44 per cent of the cost increase, some of that -- not clear how much -- is being driven by expansions of the "transmission and distribution" system... and much of that expansion is required to link all of those disparate wind and solar locations to the grid. Solar/wind is spectacularly expensive and inefficient on its own, PLUS there's an additional expense in building the wires necessary to get it to market. Note that this is a big shift from a few years ago, when coal was about 20%, and gas was around 0%. Coal has come down because gas has gone up. And that's been a big environmental benefit -- a real and substantial environmental benefit -- since gas produces about half as much CO2 as coal, per amount of energy generated, and even less smog causing chemicals. Switching to gas hasn't been high cost, it has cut Ontario's greenhouse gases generated by electricity in half, and by 2014 when coal is phased out, greenhouse gases generated by electricity will be down 75%. As I say in the essay, this is big news. The McGuinty govenrment should be congratulated, but they should also explain to people that this big environmental success has nothing to do with the ultra expensive arrival of wind and solar, which is being sold as a quasi-environmental plan, but is really just a (completely misguided, total waste of money, doomed to failure... I can go on all day...) industrial policy. We are giving huge, huge subsidies to wind and solar to "create" jobs, not to help the environment. * The installed power mix is somewhat different from the above output chart -- because nuclear is baseload power (runs all the time), gas is peak (only used when needed) and wind is unreliable (only used when available). *Generating resources as of February 20, 2011. * And this is pretty cool: you can also get a real time breakdown of how much electricity Ontario is using right now, and where it is coming from, on the homepage of the IESO. * Finally, something that everyone should read: a recent paper from Jan Carr, former head of the Ontario Power Authority, on the subject of what he sees as the economic and environmental illogic of the Ontario Green Energy Act. Like me, Carr thinks the most logical way to reduce pollution -- the most economically logical way, meaning the way you get the most environmental bang for the least buck -- is a carbon tax. Right now, we have a system that is doing the exact opposite: we have a crazy, command and control system that pays no attention to prices, and doesn't use prices to efficiently allocate resources. On the contrary, the government has basically ordered the IESO to buy the most expensive power first, and to fill the remainder of Ontario's needs with whatever cheaper power is left over, which is the opposite of how you run any other business. It's the opposite of rational. It's the opposite of efficient. We are not setting goals for greenhouse gas reductions, putting a price on carbon, and then leaving it to rational engineers and economists and investors and power users to figure out how to get to that goal at the lowest cost possible. Instead the government is simply ordering the power system to construct a certain number of solar and wind installations, and then ordering the system to buy the power produced, regardless of cost. It's insane. It's like Gosplan, only worse. It's a system that, as Carr explains far better than I do, has neither environmental nor economic logic, and thus is giving us maximum buck for minimum bang. Another critic of the system worth paying very close attention to is energy expert and environmentalist-who-uses-economics Tom Adams. One more thing: there's the question of where Ontario's pollution and GHGs come from. This document from the Pembina Institute has some good summary charts on the various sources of greenhouse gases in Ontario. The data is for 2007 -- still early days in the shutdowns of the coal plants -- and at the time the generation of electricity and heating (Pembina's table includes "heating," I assume that includse people heating their homes with natural gas and oil) accounted for just 17% of Ontario's GHGs, a number that has dropped over the last 4 years, as the amount of coal in our power system has dropped. We must now be down around 10% or so for electricity production plus whatever very small percentage of GHGs are attributable to people heating homes with oil or gas. Jan Carr (see his paper above) says that when the coal plants are fully phased out in 2014 electricity will account for only 5% of the province's greenhouse gases (plus, as above, some very small percentage for home oil/gas heating). So, as I said in the video above, if we want to reduce greenhouse gases, we'd do well to look beyond electricity, and concentrate on those sources representing the other 95% of the problem. And as the Pembina factsheet points out, the largest and fastest growing contributor is transportation, which is almost entirely cars, buses and trucks (trains and planes account for a little bit, but not much). In 2007, transport accounted for 31%, and the percentage is climbing both because the volume of GHGs produced by Ontario cars and trucks is rising, and because the volume of GHGs produced by electricity is falling. So transport accounts for around a third of Ontario GHGs now, and if you do the math on electricity falling to just 5% of GHGs by 2014, then transport will be getting close to 40% of the problem by in three years. In other words: if you want to deal with greenhouse gases, you have to look at a carbon tax -- and that includes a carbon tax on the biggest source of carbon, namely cars and trucks running on gasoline. If you want to see how they could be done, have a look at something I wrote last year for cbc.ca. It compares the Ontario approach with the carbon-tax approach used by British Columbia. Very little of the projected 46% increase in the price of electricity will be due to the Green Plan. 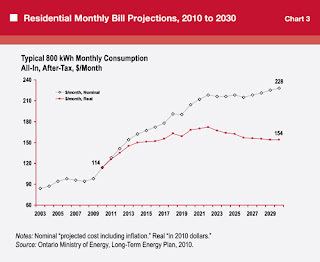 Ontario’s ambitious renewable power plan will make the province a world leader and the cost to the average Ontario household will be the equivalent of less than 1% of their electricity bills each year – less than the cost of one Tim Horton’s donut per month. That’s the message in a new report released by Clear Sky Advisors, as reported by Renewables Guru, Paul Gipe. Clear Sky's BS also appeared on grist.org, also on November 24, 2010. It amazes me the crap that greenies will throw out there, unfortunately comfortable that people will take their assertions at face value. I work in the business and know something about the math. Clear Sky's numbers are conveniently low -- by a factor of almost ten. People who propagate such mistruths should be ashamed of themselves. This is the first mistake in your calculations. Unless somebody has secretly invented lunar panels this number should be cut in half. Your comment is further proof that many people are quite happy to wade in on things they have no business commenting on. For a larger, ground-mounted solar installation (likely with two-axis tracking) with an installed capacity of "X" MW (do I need to explain the units ? ), the approximate annual energy generated = X x 0.14 x 8,760. The "0.14" is the average load factor and takes into account sunshine hour, intensity, etc. Look it up if you want but I doubt you'd know where to start. Bruce : Your calculations appear, if anything, conservative. Robert : You need a math tutor. Ask Bruce. He might need the extra money for doughnuts. truly heading to aid me a fantastic offer. Thanks for sharing your thoughts so definitely. Great article! I also use virtual data room free. It is really effective FOR BUSINESS! I think you are correct. I was satisfied when I heard one of my understudy saying, "I like it here in light of the fact that you are not a cluster of eggheads." We certainly procure coaches who can build up a positive affinity with the understudy. tutu app is a complete package splashthat.com/ which offers very easy access, fun as well as safety and security also to the users. Click Here Today, the video game Pokemon Go is offered just How To Install Tutu Helper App For Android, Iphone & Windows Pc on the TuTu application and this draws in many Tutu App customers to mount this TuTu Helpers on their tools. From fish to eggs, the griddle is an logdown.com even more constant approach of food Visit here preparation compared to standard Best American Outdoor Grills | Reviews & Ratings grills or charcoal powered cooking Outdoor Grills applies.If you've ever wanted access to an effective,Best Outdoor Grills Reviews restaurant-style frying pan. 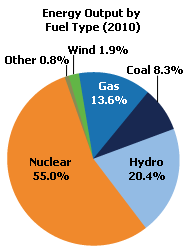 It is pretty bad that coal is still used in Canada to generate electricity. I know that the renewable energy sources are not considered reliable yet because they are intermittent, but even so, we can replace coal with natural gas for lower emissions. To understand why renewable energy will become the main energy source of the future read on facts about alternative energy how to ditch fossil fuels and embrace clean power.